I love the way the smell, and the way they fit my hands. I have been reading since childhood. I read 2 or 3 books a month. Recently, I experienced a drought. Every book I picked up bored me. This was upsetting to me. This phenomenon lasted about 3 or 4 months. Nothing seemed to break the cycle. Finally I picked up an old book that I had never read. Carriage Trade by Stephen Birmingham. One of those novels in the style of Dominick Dunne. Rich, society people who skirt the rules. Susan Cheever, Notes from a Bottle. Growing up in an alcoholic family. I cannot possibly be an alcoholic, everyone drinks. Meredith Hall, Life Without a Map. Getting pregnant at 16 in the 1960s. Giving the baby up for adoption. Finally meeting the son after 21 years apart. Hallie Ephron, Never Tell a Lie. An innocent shopper at a garage sale. The shopper disappears and the husband is arrested. Lisa Black, Evidence of Murder. How can there be no evidence of murder? A body with no marks, nothing. Jen Lancaster, Bitter is the New Black. Loses her job. Spends too much money. Chris Bohjalian, The Double Bind. F Scott Fitzgerald, The Great Gatsby. I am rereading this after reading The Double Bind. as part of the plot. Every afternoon the pool calls my name. Relax and escape to another place. Get in for my morning ritual. The conditioner is missing too. Quentin must have used it. No, that does not make any sense. He does not have any hair. He never uses the shampoo. It must be by the jacuzzi tub. Get out of the shower. Ah ha, there it is. Safe and sound in the other bathroom. Borrowed my shampoo and conditioner. and did not return it. I walk out to feed the dog. Is that coming from the dog or cat food bin? Oh, I am afraid to see what it is? Quentin, there is some kind of critter out here! He comes to check it out. It is in the dog food bag. Oh look, it is a baby opossum. What are we going to do with him? We need to wait until dark to let him go. He sleeps in the bag all day. He is about the size of a coffee cup. He looks soft, but do not touch him. In the evening he wakes up. Want to eat an orange? No. Not dark yet, go back to sleep. Quentin takes him out to the woods. He lays the bag down and waits. He waits and waits and waits. The baby will not venture from the bag. Gently turn the bag and make him come out. The baby opossum sits very still. Go in the house to get a flashlight. The night brings good news. The Easter visitor has gone home. Hey friends and family, where are you? No yelling about lost clothes. No griping about lack of food to eat. A little rain is falling. The dog is not barking. The cat is not chasing it's tail. The coffee is good and strong. The cardinal is singing his morning song. The flowers are opening their buds. Even the sun is hiding his face this morning. Or Maybe it is the Name? Maybe people do not remember me, because my name is Beth. gave her father forty whacks. I tried it out for a while in third grade. I liked to think I was named after Queen Elizabeth. I think I would need to wear my tiara every day. In high school some people thought I was Bethann Angie. One of my good friends was Angie. People always said "Beth and Angie". I morphed into Bethann Angie. *Tiffany with no last name. you are supposed to have to have a last name. A friend of a friend thought my name was Bethward. She combined my first name and maiden name. I was introduced at a party as Bethward. I always wanted to be named Finn. I thought that would be the coolest name for a grandma. Finn, can we make cookies? Come with Finn and we will paint a picture. The crazy lady with all of the cats. How many cats does she have? Black cats, gray cats, striped cats. I have grown to love my name. *From the movie, "You've Got Mail"
I have met a lot of people in my life. I am always surprised when someone doesn't remember me. that is easy to forget. Classmates who were in high school classes with me. People who went to stock shows with me. Boys that I liked in high school. I can remember 60 kids names. I frequent the same stores time after time. Spending money on gifts, necessities. I have been going to the library for 11 years. Unbelieveable that some of them still do not know my name. God bless Rose, she remembers! I have wondered about this phenomenon during my life. What is it that makes my face so forgetful? Does it matter that I am not remembered? Not really, but it is interesting. I have a face to forget. She goes to see the surgeon. The doc says, "I know how to fix this." Now it is time to decide what to do. Honey comes to see her. Aunt Sheryl and Uncle Brian come to see her. Doc writes "No" on her right leg. Request nausea meds for after surgery. They wheel her to the OR. Eat lunch while we wait. "She really needed that surgery. The bone was so loose. Wait until she wakes up. Get a her a footlong and Sprite. She eats the whole thing. She falls asleep on the way home. She has so much pain. Don't forget to take your aspirin. Do not want a blood clot. Waiting 10 days until the splint comes off. No walking. Use those crutches. Start to walk on it as you feel able. Let the pain be your guide. A long recovery results in good health. She has strength - physical and mental. In two months, she finishes her junior year. Four AP classes - done. First year without volleyball - done. In three months, she goes on her last mission trip as a youth. Lay in the sun and tan. In four months, she takes her senior pictures. In five months, she applies for college. Fill out the Financial Aid forms. Fill out the college applications. I hope I have prepared her. God, where did the time go? Please help me have a better day tomorrow. I'm walking, can I come by? Visit on the porch in the cool morning air. Have you ever heard of the BBD? It is the Bigger, Better Deal. my family was always chasing the bigger better deal. My father has a PHD in Chemistry. but he always wanted to be an entrepreneur. And so, the BBD was born in the Ward house. There were so many attempts at the BBD. We raised them to be butchered. We also had a huge garden. The plan was to sell the vegetables. In junior high we raised honey bees. Easy to bottle and sell the honey? became popular for raising new brands of cattle. Names like Chianina, Maine-Anjou, Pinzgauer and Simbrah. It never did really take off. We had a barn where we kept a variety of rabbits. and then would haul them 100 miles away to auction them off. Rabbit will be the new chicken. We leased acres and acres of land for hay baling. Plow the field, plant the Bermuda sprigs. Watch it grow, cut the hay, rake, bale, haul. Feast when it rains. Famine when it doesn't. Buy raw lumber to make furniture. Get it planed, build an armoire, quilt box, rocking chair. Each of us kids got a piece of the furniture. Did you know you can turn cooking oil into bio-diesel? Travel to numerous plants to see how it is done. Work in a plant in another state to get experience. Too much competition from big companies. Buy pieces of silver and turn them into Krugerrands. Buy silver from Craigs List or Ebay. Melt it down in the rented space in town. Who will make the Krugerrands for me? As an adult, I also pursued the BBD. I made macrame pot hangers. I took oil painting classes. I took flower arranging classes. I took a quilt class with a friend. My pursuit of the BBD was over. God gave me a ministry. Note: My dad pursued these interests while he worked as a chemist. They wait for the doctor. The room is so quiet. Things do not look so good. The baby does not have a heartbeat. We will have to do a simple out-patient procedure. Simple. What is simple about this? Simple out-patient procedure - really? Tears of sadness, disappointment, anger. What if we can never have a baby? Fear, lack of faith, frustration. Flood my mind with thought of other things. but it does distract the mind, the heart. Pray for strength and understanding. 30% of all pregnancies end in miscarriage. This does not make me feel any better. a broken, devastated, empty statistic. Teenager trying to sleep late. Mix the milk and flour. The best gravy you have ever eaten. Graduation and move to the big city. Job as a computer programmer. Bacon has less fat than cheese. Hamburgers with bacon and blue cheese. Omelet with bacon and cheese. Turkey and dressing with bacon. Big trucks, duct tape, bacon. Really? As usual, the marketers got it all wrong. Who will I go with? A date for prom with a good friend. No pressure if I go with my friend, Ben. A pink dress bought and ordered in Austin. Let's go try it on. Where will we eat on prom night? My date knows someone at Navajo Grill. He arranges a special dinner. Who will we go with? Lance and Jill are going to prom. Please go eat with us? Now we have four in our group. I go with Ben to order the tux. We need just the right color of pink for the vest and tie. The tux is ordered, now we wait. What will we do after prom? I am not going to a drinking party. Can we come to the house, Mom? Of course. What food do we need? I have to order his flower. I hate the word boutonniere. A pink rose with silver ribbon trim. It will look perfect with his tux. Aunt Donna, are you coming down? I need you to help me get ready. It will be a short trip. Friends invited for the "after" party. Fire pit is ready to make s'mores. Go with Jill to get our nails done. Go with Jill to get our hair done. Hers is long and curly, mine is in a curly "up-do". Time to get our dresses on. What jewelry should I wear? Got to meet the other girls for "girl" photos. Ben arrives. He looks so handsome. All the parents arrive to drop off food and take photos. I am getting so hot taking all of these photos. Drive to hotel for additional photos. My face hurts from smiling so much. Get in the big truck with Dad's help. We drive away while I blow kisses. God changed the direction of my life. A friend asked me to take a Community Ed class. We went to the class preview and decided a quilting class would be fun. If one class is good, two would be awesome. What is a rotary cutter? Why is this ruler so big? A 1/4 inch piecing foot; that is not very big. Scissors, neutral thread, needles, sewing machine. Learn how to cut fabric the quilters way. Learn how to sew strips. 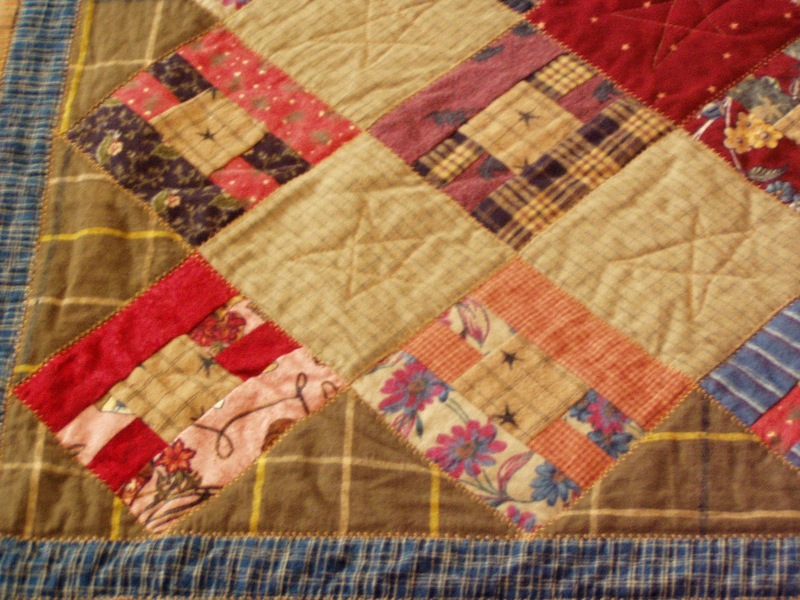 Learn how to re-cut and make the quilt blocks. I stayed up late at night. I got up early, went to work and then came home. I fed my family, put the kids to bed and then back to sewing. All I could think about was quilting. cut it up again, resewed it and then I had a quilt top. did the most awful job of sewing it together. Finally I finished the first quilt. Oh my gosh, I made a quilt! I laid the quilt on the floor and then rolled up in it. I really made a quilt. By now I really wanted to quilt all the time. I talked to him about quitting work. We have a huge mortgage payment. We have a lot of bills. Eventually we got a plan together. We decided I would quit work. We move move to a smaller town. We would buy a smaller house. We would use my retirement to pay down on the new house. We would adjust and live on one salary. It took us about a year. That is another whole story! Now how does God fit into all of this? Well I had been searching for meaning in my life. 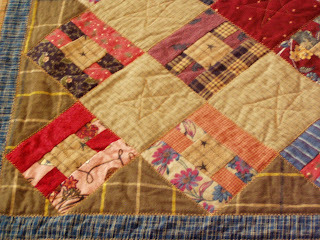 The quilting ignited a passion I had never felt. I assumed this was God trying to get my attention. I started quilting all the time. God again directed me to start a quilting ministry at my church. I was really stepping out there now. A corporate career woman starting a quilting ministry. We also make quilts for the hospital. The hospital uses these quilts when a family loses a child. I give God all the credit for helping me find my way. I never expected to be able to serve God in such a way. When I look back at my story, it reignites my passion. I am reminded that God can use all of us for his glory. and turn it into something life changing.